The cayenne pepper is a type of Capsicum annuum. It is usually a moderately hot chili pepper used to flavor dishes. Cayenne peppers are a group of tapering, 10 to 25 cm long, generally skinny, mostly red-colored peppers, often with a curved tip and somewhat rippled skin, which hang from the bush as opposed to growing upright. Most varieties are generally rated at 30,000 to 50,000 Scoville units. The fruits are generally dried and ground to make the powdered spice of the same name, although cayenne powder may be a blend of different types of peppers, quite often not containing cayenne peppers, and may or may not contain the seeds. Cayenne is used in cooking spicy dishes either as a powder or in its whole form. It is also used as a herbal supplement. The word ‘cayenne’ is thought to be a corruption of the word quiínia (also sometimes spelled kyynha or kynnha) of the Old Tupi language once spoken in Brazil, which means pepper (thus ‘cayenne pepper’ means ‘pepper pepper’). It is probable that the place Cayenne in French Guiana was named after the peppers, not vice versa, although it is commonly claimed that the pepper was named after the city. Nicholas Culpeper, for example, uses the word ‘cayenne pepper’ in 1652, and the city was only renamed as such in 1777. It also is possibly named for the Cayenne River. Culpeper, in his Complete Herbal from 1653, mentions cayenne pepper as a synonym for what he calls “pepper (guinea)”[note 1] By the end of the 19th century ‘Guinea pepper’ had come to mean bird’s eye chili or piri-piri, although he refers to Capsicum peppers in general in his entry. In the 19th century, modern cayenne peppers were classified as C. longum, this name was later synonymised with C. frutescens. Cayenne powder, however, has generally been made from the bird’s eye peppers, in the 19th century classified as C. minimum. Cayenne peppers are long, tapering, 10 to 25 cm long, generally skinny, mostly red colored peppers, often with a curved tip and somewhat rippled skin, which hang from the bush as opposed to growing upright. There are many specific cultivars, such as ‘Cow-horn’, ‘Cayenne Sweet’, ‘Cayenne Buist’s Yellow’, ‘Golden Cayenne’, ‘Cayenne Carolina’, ‘Cayenne Indonesian’, ‘Joe’s Long’, ‘Cayenne Large Red Thick’, ‘Cayenne Long Thick Red’, ‘Ring of Fire’, ‘Cayenne Passion’, ‘Cayenne Thomas Jefferson’, ‘Cayenne Iberian’, ‘Cayenne Turkish’, ‘Egyptian Cayenne’, ‘Cayenne Violet’ or ‘Numex Las Cruces Cayenne’. Although most modern cayenne peppers are colored red, yellow and purple varieties exist, and in the 19th century yellow varieties were common. Most types are moderately hot, although a number of mild variants exist. Most varieties are generally rated at 30,000 to 50,000 Scoville units, although some are rated at 20,000 or less. Cayenne powder may be a blend of different types of peppers. Cayenne powder is distinguished from other chili powder, as it is made from cayenne peppers only, whereas chili powder is generally a mixture of multiple varieties of chili pepper, and may include other spices. It is used in its fresh form, or as dried powder on seafood, all types of egg dishes (devilled eggs, omelettes, soufflés), meats and stews, casseroles, cheese dishes, hot sauces, and curries. 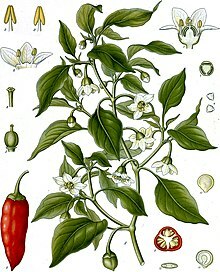 ^ The name Guinea pepper often means Aframomum melegueta or Piper guineense at present, but in Britain in the 16th and 17th century ‘Guinea pepper’ or ‘ginny pepper’ was the common name for Capsicum peppers in general. 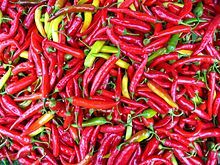 ^ However, in French, for example, the name piment de Cayenne [fr] may refer to all types of C. frutescens and other types of C. annuum including tabasco, piri-piri or Bird’s eye chili. ^ a b c d e f “Database of Chilli Pepper Varieties”. The Chileman. Retrieved 9 November 2017. ^ a b c “Cayenne Pepper”. The Epicentre. Retrieved 9 November 2017. ^ a b “cayenne (pepper)”. Your Dictionary. Retrieved 9 November 2017. ^ “Cayenne pepper (capsicum pepper plant)”. Memidex. Retrieved 9 November 2017. ^ “Cayenne (n.)”. Etymonline. Retrieved 9 November 2017. ^ Small, Ernest (2009). Top 100 Food Plants. NRC Research Press. pp. 157–. ISBN 978-0-660-19858-3. ^ a b c Nicholas Culpeper (2013). “Guinea Pepper”. Culpeper’s Complete Herbal. Lulu Com. ISBN 978-1-291-28486-7. ^ “Cayenne, French Guiana”. Britannica. Retrieved 9 November 2017. ^ Parkinson, John (1904). Paradisi in Sole Paradisus Terrestris. London, Methuen and Co. p. 431. ^ a b c Ridley, Henry Nicholas (1912). Spices. London: Macmillan, Ltd. pp. 360–383. ^ Hudson, Selma (1971). About Spices. Melmont. p. 38. ISBN 9780516082103. Nutrient Data Laboratory; et al. “99369: Peppers, cayenne, raw (Capsicum annuum)” (PDF). USDA Database for the Flavonoid Content of Selected Foods (2.1 ed.). p. 68 (PDF p. 3). Archived from the original (PDF) on 19 August 2008. Retrieved 13 July 2011.